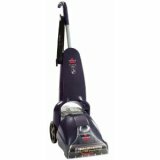 Bissell steam cleaner models vary. The company manufacturers some of the most reputable household appliances used in America today. By way of background which we hope will strengthen your resolve and increase your confidence should you like some of the Bissell steam cleaner reviews presented here; Bissell the company was started as way back as 1876 by a couple named Anna and Melville Bissell. Their first product inspired by a desire to deal with saw-dust was the popular carpet sweeper which made way to a range of home cleaning appliances due to its unprecedented success. Bissell's products are essentially designed to provide practical time saving home cleaning tools which are light weight and easy to store. These are intended to produce better results in your cleaning endeavors than any ordinary cleaning tool you might care to think of. Today the company has a variety of Bissell cleaning products which include vacuum cleaners and deep cleaners with built-in water heaters that gives you the best results. Their first plant to manufacture Bissell cleaners was opened in Michigan, Grand Rapids. The following are reviews of selected Bissell steam cleaners. In order not to waste time we prefer to review the top steam cleaners by Bissell to help you determine if you should really follow the crowds. We also include some machines which we think are of good quality and reputation even though they might not be as popular on the market as the ones everyone is flocking to. Most people follow price, yet price is not the best reflector of a good quality product. If anything it might be to the contrary. 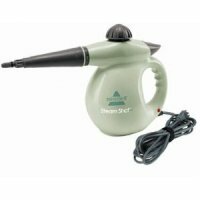 This steam cleaner sells on average for under $150.00. As the name would suggest, this product is two products in one namely the steam cleaner and the mop. Unlike some pressure washers also reviewed else where on this site, the steam cleaners such as this one are designed for comfortable indoor use. they produce no fumes or chemical emissions and run on electric power available inside your home. This steam and sweep hard floor cleaner is meant to be used on your hard floors such as those that are tiled, wooden floors and even cement floors. Due to safety considerations in the design, in order to get steaming you will need to squeeze the trigger down each time to achieve this. This can easily turn laborious when you have a whole house to clean. You have to hold the trigger down for continuous steaming. This Bissell steam cleaner apart from steam cleaning will also remove all debris that might be on your floor through a vacuum system. All this is achieved whilst you are standing providing tremendous ergonomic benefits. You will not need to bend in order to do some house work with this cleaner. We personally recommend this cleaner and confirm that it is deservedly highly rated across the internet. It has great maneuvering ability making it possible to fit under your home fittings and so on. We highly recommend this product, it has been purchased by hundreds of people for good reason. 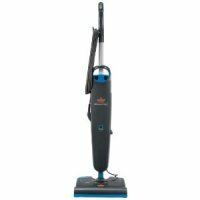 This Bissell steam cleaner is shipped with three different color coded brush attachments which you can separately dedicate to specific cleaning projects for hygiene purposes. the 16 foot secure electric code enables you to do your cleaning in one room with easy mobility. This little machine essentially uses the concept of pressure washers. It has a nozzle which releases pressurized steam for efficient cleaning. One of the reasons that has made this steam cleaner popular is also it ability to steam fabric. This means you can use it to refresh fabric or straighten it out using a special nozzle. There are no chemicals involved when the machine is cleaning. It uses water which is turned into steam. This takes care of possible dangerous fumes and cleaning residue. We think this is a good buy. However consider its size vis-a-viz your intended use. For example you will need to refill your reservoir of cold water roughly every 20 minutes of cleaning. Some cleaning projects might take longer due to its size. Overall we give it a 4 out of 5 stars rating. - the power sometimes feels too low for some projects. 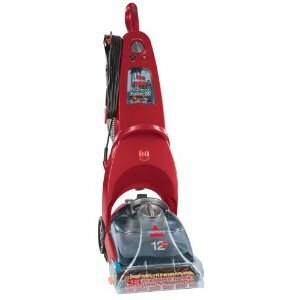 See more Bissell products such as Bissell Steam Mop Cleaners, Bissell hard floor steamers and Bissell steam carpet cleaners available on the market. The following are possible options to consider when looking for thorough home cleaning. These are not steam cleaners but are deep cleaners especially designed for carpets and homes which have pets.